‘Splosion Man was developed by Twisted Pixel Games and retails for 800 MSP. It was released July 22, 2009. ‘Splosion Man is a platform jumping game in which our hero must escape the lab where he was created. He is armed with only one weapon: the ability to repeatedly explode himself, or “splode”. When he does, he is launched into the air. This is, in effect, his jump and attack rolled into one. He can splode three times in succession and splode off of walls to get where he needs to go. This simple mechanic is quick to pick up and carries our hero through the many difficulties that follow. And there are many traps waiting: acid, attack robots, lasers, and giant vices to name a few. But there is always a unique answer to each problem. Simply put, this game gets platforming right. Great presentation – ‘Splosion Man is a bright and colorful game that is easy to look at. 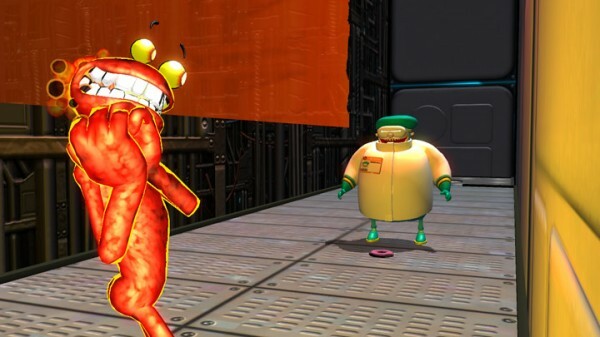 Splosion man himself is full of lively animations, as are most other characters in the game. The music perfectly fits the theme of the game, both in tension and in humor. There is a lot to like in this package. Twisted Pixel even threw in bits from their previous game, The Maw, for a little fan service. Tight controls – A platformer like this just wouldn’t work without spot on controls. ‘Splosion Man delivers tight controls where they are needed. The control scheme is incredibly simple; the player character can run and splode. The later levels can be very unforgiving, but thanks to the tight controls players can get through them without any controller-throwing frustration. 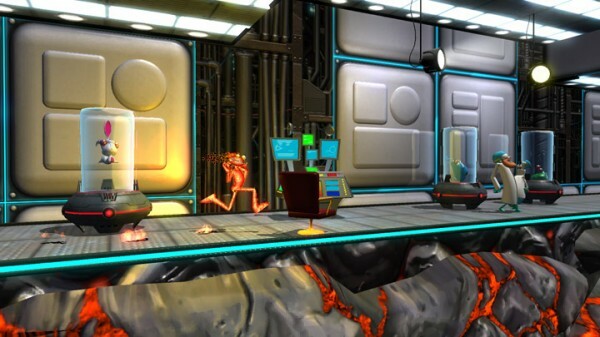 Fantastic level design – The level design in ‘Splosion Man is designed to make the game play as fast as possible. This game tends to reward jumping out into oblivion at full speed more than punish it. This was an intentional choice to speed up game play and it was the right choice for this game. LOL humor- Splosion Man is funny, laugh out loud funny. The music is hilarious. The entire soundtrack has a quirkiness to it that sets a playful, hectic pace. One of the game’s songs Donuts, go nuts! has become an internet hit, even landing itself as a downloadable track for Rock Band and the karaoke game Lips. 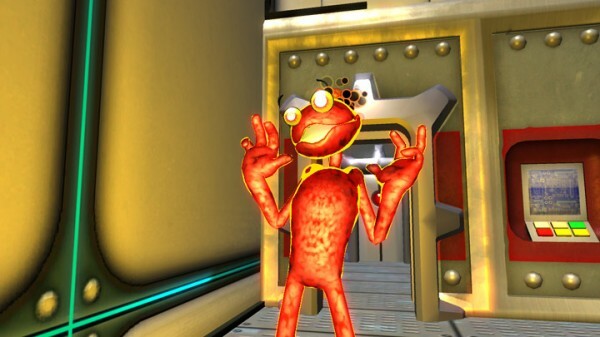 The popularity of the music led Twisted Pixel released the entire soundtrack for free, and has led to comical parodies by fans, such as The Splode Beneath my Splosion. Splosion man himself says the most ridiculous things. Blowing evil scientists up into cuts of meat is a nice touch too. Everything in this game is intended to bring a smile to the players face. It’s a welcome change from the serious and dark games that are so prevalent today. Multiplayer is only O.K. 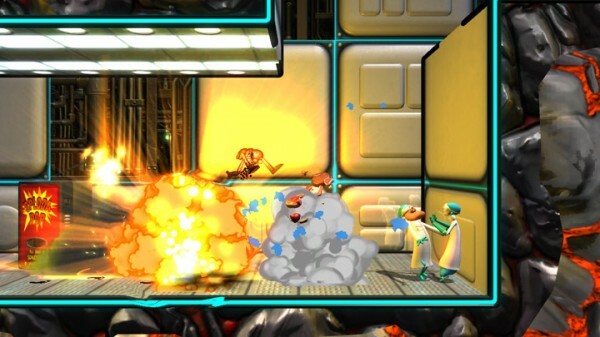 – A lot of reviewers say the multiplayer in ‘Splosion Man is unplayable due to lag. That’s simply not true. Still multiplayer is not as much fun as the single player mode is. The changes made to the levels to accommodate multiplayer really kill the pacing of the game. A lot of credit needs to be given to the developers for designing 50 additional levels for multiplayer. Unfortunately they just aren’t as fast paced and can kill the adrenaline rush that the single player portion has. Some challenges are unfairly difficult – ‘Splosion Man gets progressively more difficult as the game goes on; towards the end the game it’s downright tough. But, there are a few obstacles that come to our minds that are completely unfair. These moments were few and far between and can ultimately be overcome, but getting past them made us not want to do them again. For a game as tight as ‘Splosion Man it was a shame to see these occasional blips. 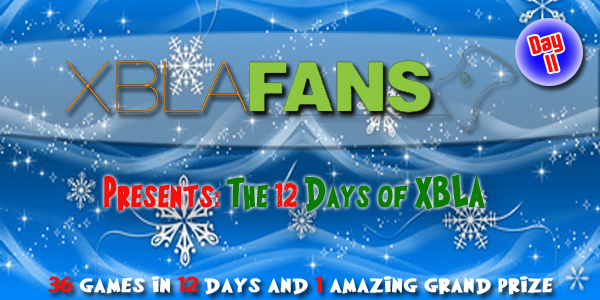 ‘Splosion Man easily stands up to the best platform competition there is on XBLA. It can hang with Super Meat Boy any day of the week. Even those who are not fans of wacky humor will love the tight gameplay. We can’t say enough good things about it. This is one of the rare games that gets it all right: it looks and feels great, it packs a great challenge, and it feels great to finish it.